In this second part of a two part series on donor psychology, you will learn the reasons why people give. Jeremy has identified 15 different psychological triggers that moves someone to donate to your nonprofit. 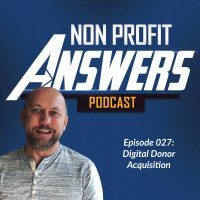 In this episode, Jeremy explains the second 7 motivations, or donor psychological triggers, that help someone make a decision to give to your nonprofit. This is a fascinating look at why people give and how you can change your messaging or produce events that create more donors. For major donors, general donors, and monthly donors. Welcome to the second episode in a series about the psychological triggers that trigger someone to make a donation at your nonprofit. In this series we’re learning about how to do fundraising in nonprofits. My daughter Emily, who’s 15, has shown some interest in nonprofit fundraising so I started this series on order to show her what she needs to know to become a fundraising expert. In the first episode in this special series, we talked about the motivations for giving and then the episode before this, the first eight ways that you psychologically trigger someone to want to make a donation to your organization. And this episode, we are going to go through the final seven triggers of what will psychologically make someone want to donate. Really excited to have you here. There’s a tremendous amount of information in this episode and I’m excited to get started. We’re going to start out at number nine on our list. Number nine on our list of psychological triggers is, people will go to great lengths to appear consistent in their words and action. When people make a commitment publicly such as a desire for a weight loss goal, they’ll go to great lengths to appear committed to that goal. This is why when somebody wants to lose weight, stating publicly to their friends and family their goal, it’s a strong motivator to follow through on their commitment. You’ve probably heard the metaphor about the frog in the boiling water, right? You put a frog in cold water and then slowly turn the temperature up one degree at a time. The frog never realizes there’s a threat because it’s happening so gradually. By the time that water is boiling, it’s too late for that poor little frog. If you try to throw a frog into boiling water, the frog will immediately jump out. Just like the frog, your brain is trained to see new opportunities as a threat and it suppresses your rational decision making. And so when you see something new, your mind jumps into fight or flight mode. Instead of throwing someone right into a call to action, a request for money, you want that person answering small yes questions along the way. By answering these yes questions throughout an appeal, it increases the likelihood that the reader will convert. This principle, it also works with small commitments. As a nonprofit, when you get people to make small commitments, then they’re more likely to make a larger commitment of a donation later. For example, if you get someone to like your Facebook page, to sign up for your email list, to advocate for your organization, to volunteer, all of these things will drive them to be more likely to donate later. We call these micro commitments. These are small commitments that reinforce the idea that your organization is a good one to support. As these small commitments build up over time, the person is more likely to become a donor because of these small commitments that they made. They want to appear consistent in the support that they’re showing, especially publicly when they do something like volunteer for an organization that they believe in. The tenth psychological trigger, people give to organizations they like. People are more likely to say yes to an appeal if they like your organization. There’s an old saying that people give to people, they don’t give to organizations. As you design your brand, as you develop your stories to appeal to donors, you want to appeal so that people will like and have positive feelings toward your organization. If they like your organization, they’re more likely to give to it. This principle also applies to celebrity endorsements. If someone values the opinion of a particular celebrity, having that celebrity endorse your organization increases the likelihood the person will become a donor. Many organizations will have a face of the organization like your president, that will speak at media and public events. People connect to people. Having a recognizable personality associated with a nonprofit, it could increase the likelihood that some people will give. Number 11, people give to an authority organization. In marketing there’s a concept called the halo effect. Essentially the halo effect means that people will ascribe good feelings to your organization based on the people that are associated with it. When someone feels good about someone else then the people around that person, they feel good about them too. If a celebrity, an expert or another personality is associated with your organization, people will associate the feelings, good or bad, towards the people that are associated with your brand. If you decide to go down the road of having a celebrity endorse your organization, or serve as a spokesperson, becomes very important on who that celebrity is that you pick for your brand. You never know when someone’s going to have a moral failure or something that goes wrong in their life. When you have people that ascribe a good feeling about your organization because of the celebrity associated with and that celebrity has a moral failing, then the halo effect could also cause those people, the potential donors to have negative feelings towards your organization because you’re associated with that celebrity endorsement. When you use experts to explain the impact that your organization makes, then donors will associate those experts with your organization. The expertise they have. The credentials of that expert, they’ll associate those with your organization. It’s important to select experts that are well known in their field who do not have a negative connotation around who they are or their life outside of their expertise. When you pick an expert that will publicly endorse the work of your organization, then people will be more likely to give because they feel that your organization is an authority. Number 12, people are motivated when they think they’re going to miss out on an opportunity. An opportunity could be defined in a number of ways. A lot of organizations use urgent stories or stories that describe the urgency of the cause in order to motivate someone to give. Urgency is a fabulous motivator for nonprofit giving because people really want to give to a need that is more urgent. Let me give you an example. If two like minded organizations appeal to the same person and one of them uses urgency in their story and the appeal and the other one doesn’t then the reader of those two appeals will look at the one with urgency and say, “They need my money right now.” They’ll look at the one that doesn’t have urgency and they’ll say, “Well they can wait. I can give to them later when I have money again.” And most likely that gift will never come because they’ll see another appeal from another organization that has urgency and they’ll want to give to that urgent appeal. And so as an organization when you send these appeals out, you want to develop appeals that have an urgent nature to them in order to appeal to people so that they don’t miss out on an opportunity. You can also as an organization, use exclusive items like premiums, tickets to events that are limited in nature in order to motivate people so they don’t miss out on an opportunity. The opportunity of getting that item or going to that event. For example, at Christmastime you might make a custom ornament and the first 200 donors that give over a $150, receive that custom ornament. Once they’re gone, they’re gone. People don’t want to miss out on the opportunity so they’ll give in order to receive the ornament before it runs out. As I mentioned, events. Another great way. There are limited seats for most events and so putting a limit on those number of seats that are available, that’ll motivate people to give because they’ll want to attend that event. Number 13, people want unity. When you survey your donor audience and we’ve surveyed our donor audience many times, what we find and what I suspect that you’ll find is that donors crave community. They want to be around people who are like minded to them. They want to be around people who give to the same causes, attend the same church, have kids in the same school, are in the same sporting activity together, enjoy the same football teams. People want to be around those who are like them. And they want to take the shared ideas and values and combine those with identities and that’s what makes a group turn into unity. As a nonprofit you want to create opportunities for your donors to connect with others that have a shared purpose. This might be as simple as creating a closed Facebook group for your supporters that allow them to connect to people in their area or even remotely, who share the same interest and excitement for the cause as they do. Number 14, people think in terms of people. Our brains are wired to help manage our social interactions with each other and people get engaged with the stories about other people. There’s some well known studies where researchers used an MRI machine to study the brain patterns of people as they hear stories. At the same time they were studying the brain patterns of the people that were hearing the stories, they were studying the brain patterns of the people were telling the stories and what they found was the brain patterns started to sync up. People could literally in their mind, picture the same things or images and align their mind with the storyteller. This is a powerful finding that when you tell a story, people are actually picturing in their mind the same things that you’re picturing in your mind and your emotions are syncing up. It works both in terms of reading a story as well as hearing a story. Somebody can read it in print and their brainwaves are actually going to be so similar to the brainwaves to the person that wrote the story. People enjoy the stories and the feelings that they get when they’re able to solve a problem. You want to help people feel accomplished. You want people to hear your stories of need and to feel like their gift is going to make difference in the life of that beneficiary. People don’t want to feel manipulated or coerced. They don’t want to feel like you’re taking advantage of them so you have to be very careful. There’s a fine line between providing an urgent appeal of a story with a beneficiary in it and that beneficiary has a great need, and telling a story that makes people feel like your organization is taking advantage of them. You succeed as a fundraiser when you make the donor feel joy when she gives that gift. That feeling of joy, it’s not happiness. Joy and happiness are two separate things. When you develop that feeling of joy within someone, that joy is them giving is knowing that their gift is going to make a difference in the person of the story that you just told them. And the fifteenth and final psychological trigger that motivates people to give is that people love to give. As I mentioned, people love that joy of giving and knowing that their gift is going to make a big difference in the life of someone else. Thank you so much for joining me for these final seven psychological triggers to motivate people to give to your nonprofit. I hope that they’re very helpful as you produce your appeals and as you develop your fundraising campaigns to keep these mind of things that help trigger people in a good way to want to give to your organization. In the next episode, we’re going to learn about how to get those first gifts going when you start a nonprofit or how to start up a new fundraising program within your nonprofit. Thanks.